WHITE LIGHT POINT BASED ON white POWERLED . WHITEPOINT white lighting controlled by DREAMTIME system. It can be a part of a scene (or a few scenes), or it can be used independently as a white light source with individually controlled sections: turning on/off, dimming and pulsation. A single WHITEPOINT light source generates a 120 lm light output equal to a traditional 10W incandescent bulb. WHITEPOINT light spots are installed in the same way as the coloured ones or, optionally, they can be fitted into SKY panels. The system includes max. 10 x WHITEPOINT light spots in max. 3 bundles (3 x 10). 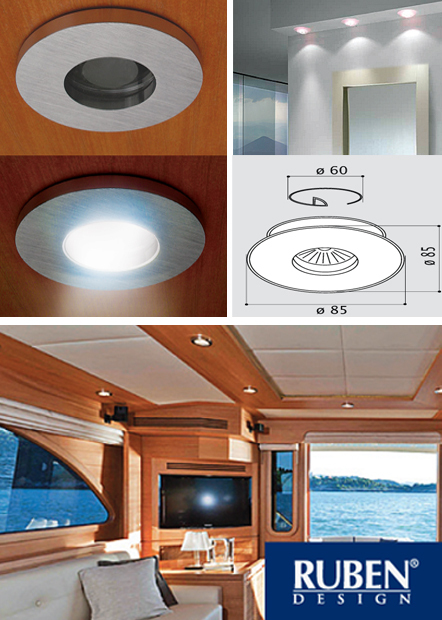 WHITESPOT LED lighting is controled by bDREAMTIME system controls . LED wattage up to 10 W.
OTHER AVAILABLE LIGHT SOURCES CAN ALSO BE USED.